The American Association of Woodturners' symposium in Pheonix featured three days of woodturning demonstrations and several galleries of truly amazing turned work. I presented "OT Artistry - Beyond the Rose Engine" detailing the social history of ornamental turning by sharing designs from some of the most accomplished practitioners along with the variety of tools and techniques used with traditional and modern OT lathes. 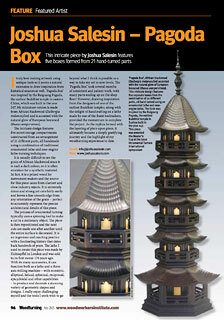 The April 2014 issue of UK's Woodturning magazine featured my Pagoda Box and detailed my approach to ornamental turning. The magazine is read by turning enthusiasts in over 60 countries! 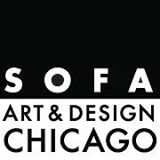 A multi-part work entitled Currents was on display at SOFA Chicago. During the event, Betty Scarpino (wood artist and editor of American Woodturner) presented "Currents in Contemporary Woodturning," a slideshow and lecture featuring my ornamental turning work among other artists defining contemporary woodturning. I had the pleasure of restoring a Plant two-stage geometric chuck, circa 1865, to fine working order. This chuck produces cycloidal patterns of all types, from a simple ellipse to an infinite variety of complex and beautiful geometric figures (similar to the Spirograph toy made 100 years later). 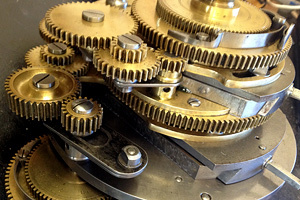 I am currently exploring the range of possibilities of three-dimensional cutting in wood using the variety of change gears and setups the chuck offers. It's particularly fun and challenging to connect the tools of the past with modern design! The biannual Ornamental Turners International symposium was held in Scranton, PA, where I was awarded the Master's Cup (for the second time in a row). 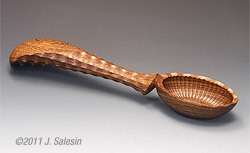 The prize-winning Ornamental Spoon was made from a single piece of brown ebony hand-turned on five centers using both ornamental and rosette lathes. 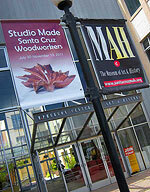 Santa Cruz Woodworkers exhibit Studio Made at the Santa Cruz Museum of Art & History ran from July through November 2011. A wide range of my work was presented among the ten artists showcased. Read the Santa Cruz Sentinel review or Lisa Jenson's Online Express, in which she muses, "Salesin's incredibly intricate and diverse pieces, ranging from fingernail-size to about and inch or two high, may be the most breathtaking objects in the show." 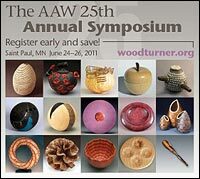 From more than 1500 pieces at the American Association of Woodturner's 2011 Symposium Instant Gallery in St. Paul, my Cosmic Burst pattern bowl, along with approximately 20 other artists' pieces, was selected for critique. Luminary turner and teacher David Ellsworth along with collectors Jane & Arthur Mason selected and discussed the work. Among the comments, included "He’s given us a hint on the outside of the rim, as to what to anticipate potentially on the inside, even though we don’t know until we get there. It’s kind of like the right dress on the right person at the right time." The 25th annual American Association of Woodturners' symposium featured rose engine demonstrations, lectures and trade show booths with ornamental turning equipment. I presented "A Decade of Turning Boxes" detailing tips, tricks & traps from my ornamental box-making experience and demonstrated how tools, technique, and artistry impact results. 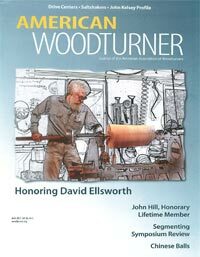 The June 2011 issue of American Woodturner magazine featured three of my "Lattice Boxes" in the gallery section of an article entitled "Ornamental Turning – A Cricket Cage."